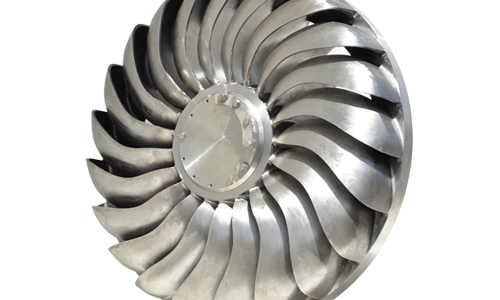 Turgo Impulse turbines are applicable for medium to high head applications and overlap the boundary of Pelton and Francis machines. These turbines are well suited to “run of river” schemes as they can tolerate some “dirty water” and perform well over a wide flow range. Whilst their peak efficiency is lower than Francis machines, they can often generate more energy due to their flat efficiency curve and high partial load efficiency, and as such can be preferable where considerable water supply fluctuations are experienced. The use of deflectors can mitigate issues of pressure surges in the upstream pipework, even on full load rejections.